In choosing an appeal court judge to become the next Supreme Court justice, President Barack Obama said, “I am proud to announce my nominee for the next Justice of the United States Supreme Court: Judge Sonia Sotomayor.”Â As the first African American president, he has chosen as his first pick the first Hispanic to be on the nation’s highest court.Â Barring any unforeseen hurdles, court watchers predict a smooth confirmation, especially since the Senate already has a large Democratic majority with and soon-to-be addition (Al Franken from Minnesota). Appearing with Sotomayor in the East Room of the White House were her mother, Celina Sotomayor; her stepfather, Omar Lopez; her brother, Juan; her niece, two nephews and sister-in-law.Â She was born and raised in the Bronx, New York, and started her legal career as an assistant district attorney in New York City after attending Princeton University (B.A. ).Â She earned her law degree from Yale University where she was also the editor of the Yale Law Journal and the managing editor of the Yale Studies in World Public Order. Her legal career has spanned three decades and she has worked at various levels of the judicial system–an item which gives her vast practical as well as a depth of legal experience.Â As a graduate of two of the nation’s leading universities and the experience of a big-city prosecutor and corporate litigator, if confirmed, Sotomayor would be the only justice with experience as a trial court judge. Sotomayor was appointed to the U.S. Court of Appeals 11 years ago and during that time she has dealt with an array of complex legal and constitutional issues.Â In addition, she is a lecturer at Columbia University and had been an adjunct professor at New York University Law School. 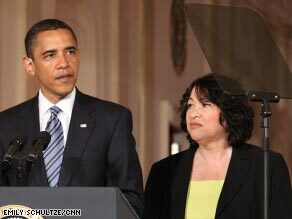 The Los Angeles Urban League applauded President Obama for the historic nomination of Judge Sonia Sotomayor to be the next Associate Justice of the United States Supreme Court. “Judge Sotomayor has demonstrated excellence and distinction as a trial attorney and she has compiled an extensive record of judicial expertise. She possesses the real-life experience that President Obama has determined will be critical to the new Associate Justice, who will be called upon to apply the law in a manner reflective of everyday lives and circumstances,” said Los Angeles Urban league president Blair Taylor. “In making a determination on whether to support a federal judicial nomination, the major concern of the Los Angeles Urban League is whether the nominee’s record demonstrates an understanding of the need to continue the fight for African Americans and other minorities so as to secure economic self-reliance, parity, power and civil rights. Throughout our history the courts have played an unparalleled role in ensuring that the most underserved in our communities would have the hope of achieving equal opportunity. Like many of the constituents we serve, Judge Sotomayor’s record indicates that she has overcome innumerable obstacles on her way to achievement. She is an inspiring woman whose record reflects a commitment to equality,” added Taylor. The Los Angeles Urban League joined the chorus of leaders and organizations that are urging the U.S. Senate to move Judge Sotomayor’s nomination forward expeditiously.